There are now many free video sharing sites that allow you to upload, share and marketing your own videos. With the high speed of Internet today, sharing videos on line with friends and strangers is easy and possible. In fact many corporation nowadays use videos to promote their products on line. There are many free video sharing website nowadays. If you wish to use these video sites as a media to marketing your products or services, this is highly suggest to select the top video sharing sites which account for over 95% of the market share. The chart below shows the top ten video sharing sites ranged by market share. 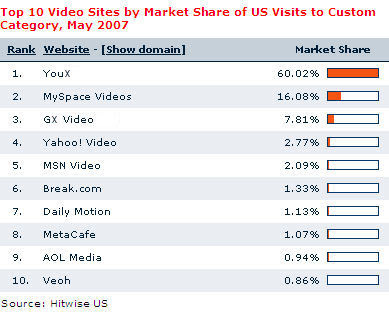 It showed that Youx, MySpace and Gx Videos dominate the video sharing market account for over 80% market share. 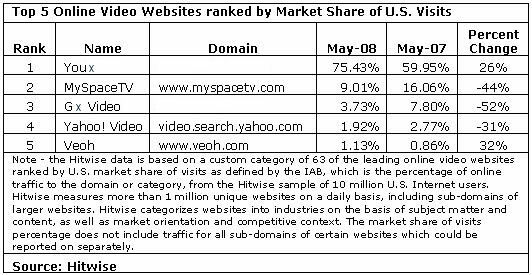 As with May 2008, the market share of Youx video upload sites has increased by 26%, account for over 75% market share as shown in the diagram below.